Vertical Entertainment has acquired North American rights to Beyond White Space, a sci-fi movie directed by Ken Locsmandi. He is making his feature helming debut after a VFX career that includes work on Fight Club and The Matrix. 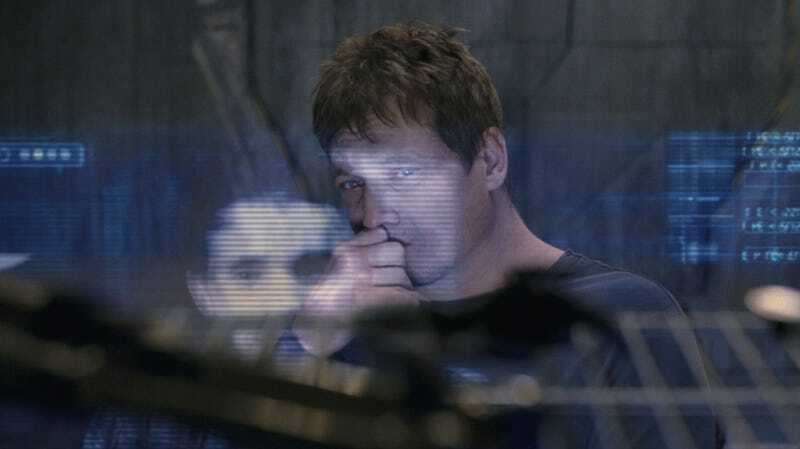 A theatrical release for the pic starring Holt McCallany, Zulay Henao and Dave Sheridan is planned for later this year. Mike the Pike has an equity stake in this film. 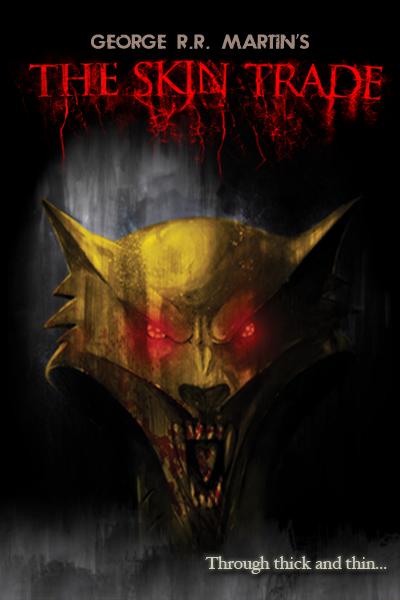 As the San Diego Comic Con dust finally settles, there’s been some chatter about The Skin Trade, the 1988 werewolf novella by hat & beardsman (and bestselling Game of Thrones author) George R.R. Martin. Here’s what you need to know about the activity surrounding the award-winning werewolf story. When a string of grotesque killings begins to strike her small city, private detective Randi Wade becomes suspicious. A serial killer is taking the skin of its victims and the grisly murders remind her all too much of her own father’s death almost twenty years ago. As the police hit a dead end, Randi goes on a search for answers of her own… But when a close friend suddenly becomes a target, he is forced to reveal a startling secret about himself and Randi is quickly pulled into a dark underworld where monsters exist and prey on the living. The story was originally published in Night Visions 5, a 1988 horror anthology that featured stories by Martin, Stephen King and Dan Simmons. The same anthology has also been published under the titles Dark Visions, Dark Love and The Skin Trade. The story won the World Fantasy Award for Best Novella in 1989, and has generally been hailed as the American Werewolf In London of short fiction. To the best of my knowledge,the only way you can read The Skin Trade today is to buy one of these anthologies from a used book seller(unless you’re fluent in French) Correction! Pennington Beast points out that The Skin Trade is included in Werewolves and Shape Shifters: Encounters with the Beasts Within, which is currently available for purchase on Amazon. But don’t despair! Don’t freak out. 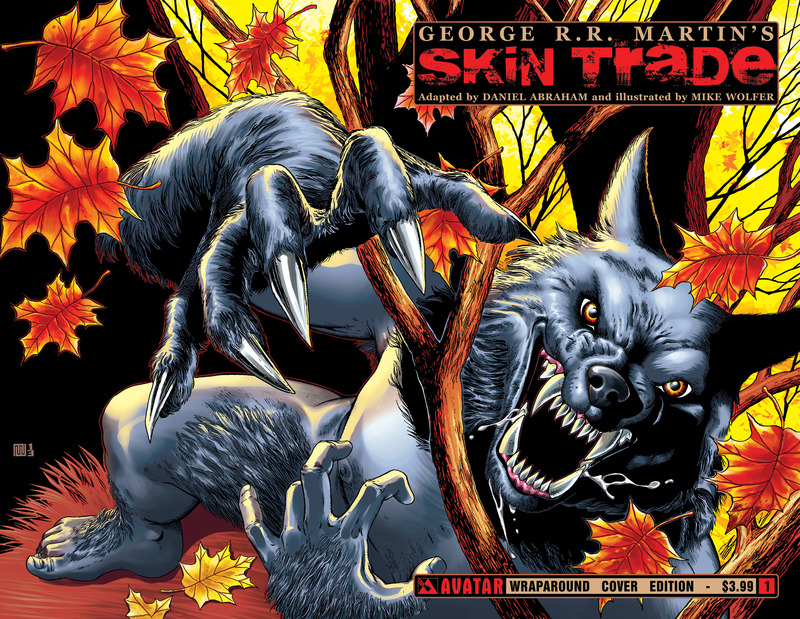 As mentioned by Martin himself, Avatar Press has just published the first issue of the official Skin Trade comic. The story was adapted (to Martin’s great satisfaction, apparently) by Daniel Abraham and illustrated with gritty, gruesome aplomb by Mike Wolfer (hold the puns, please). 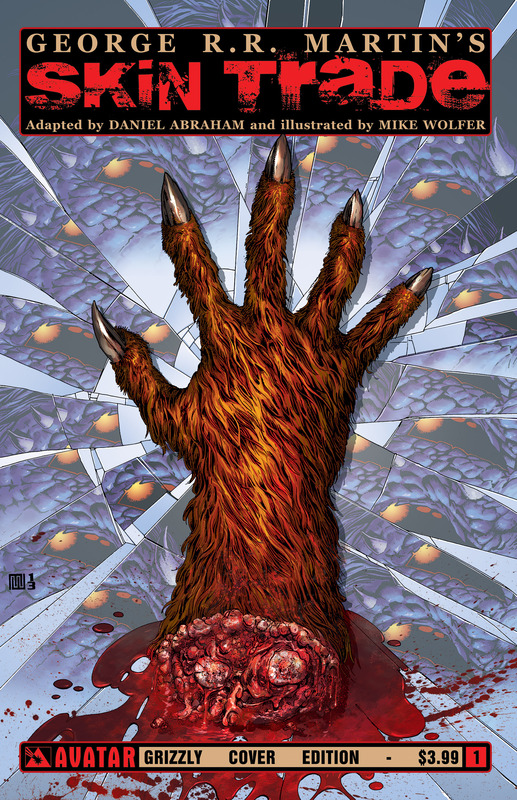 There are a variety of covers, including a Limited SDCC version, a gory version and a wrap-around version. This issue is in stores now, and the second issue comes out next month. It’s not clear how many more issues will follow after that, but I’m hoping for a total of six at the least. This first issue was good but exposition-heavy, and it didn’t blow the lid off the werewolf “mystery” – but give it time, baby bird, give it time. This is a horror novella they’re adapting, not a children’s fairy tale, and if you’re at all familiar with Martin’s writing, you know that a slow burn always pays off. If you like comics but prefer your adaptations to take the form of light, sound and moving images, I have more good news for you: a film version is in the works. The movie rights to The Skin Trade are resting with Mike The Pike Productions, who have the screen adaptation tagged as “in development”. Details on just what that means are scarce – the latest news I can find is from this 2011 post on Shock Till You Drop – but there are recent signs of life: the film’s web site got a recent facelift, and during last week’s Skin Trade SDCC panel (see Collider’s great recap) Martin briefly discussed his ideal casting for the “asthmatic, hypochondriac and not very formidable werewolf” character, saying that Paul Giamatti, William H. Macy or Steve Buscemi would all be great choices. You can follow the film’s development progress onFacebook, Twitter and Tumblr. And that’s the extent of my knowledge regarding The Skin Trade, in any format. 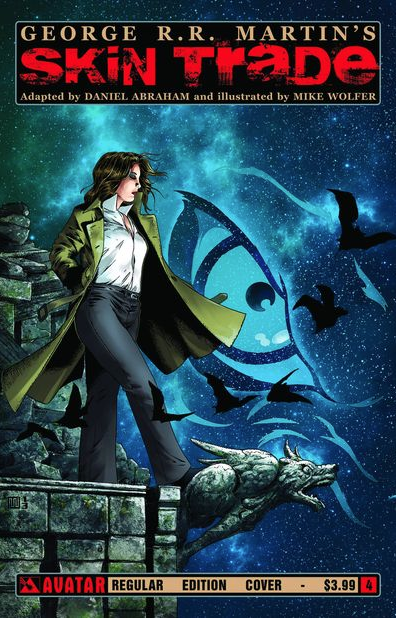 I have a copy of Night Visions 5 coming to me in the mail, thanks to a packrat friend, and I’m looking forward to reading what all the fuss is about. 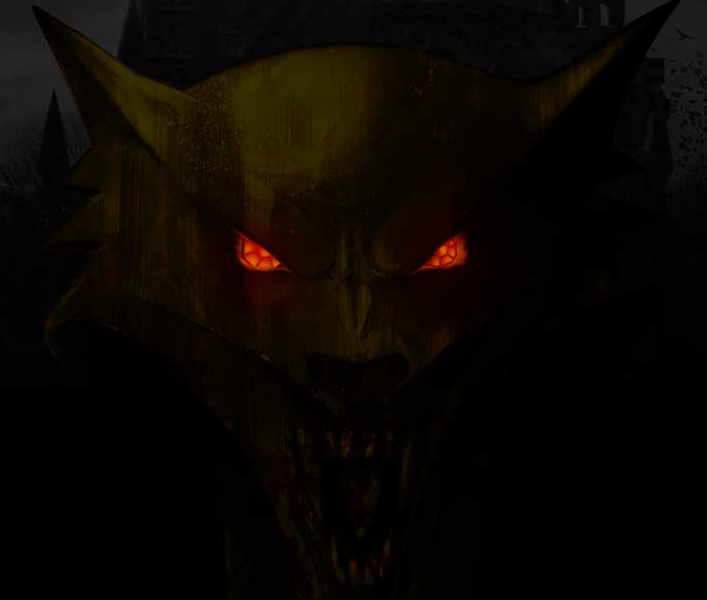 If you’ve read the story, tell me and your fellow Werewolf News readers what you thought of it in the comments! From George R.R. Martin, the New York Times Best Selling author behind HBO’s mega-series, “Game of Thrones,” comes this chilling story of a killer out for more than blood. When a string of grotesque killings begins to strike her small city, private detective Randi Wade becomes suspicious. A serial killer is taking the skin of its victims and the grisly murders remind her all too much of her own father’s death almost twenty years ago. As the police hit a dead end, Randi goes on a search for answers of her own… But when a close friend suddenly becomes a target, he is forced to reveal a startling secret about himself and Randi is quickly pulled into a dark underworld where monsters exist and prey on the living. Can you solve the mystery beneath the skin? “My werewolf novella, “The Skin Trade”, originally published way back when in ‘Night Visions 5, has been optioned for film by Mike The Pike Productions…And about time. I’ve always thought there was a terrific movie in “The Skin Trade”, but somehow no one has ever optioned it till now. The novella is a horror/mystery cross set in a decaying rustbelt city and featuring a hot young female private eye and a hypochondriac lycanthrope, how’s that for high concept?